New tire and wheel conveyor trailers are helping mounted and inflated tires and wheels roll more smoothly into GM’s Detroit-Hamtramck , MI assembly plant. 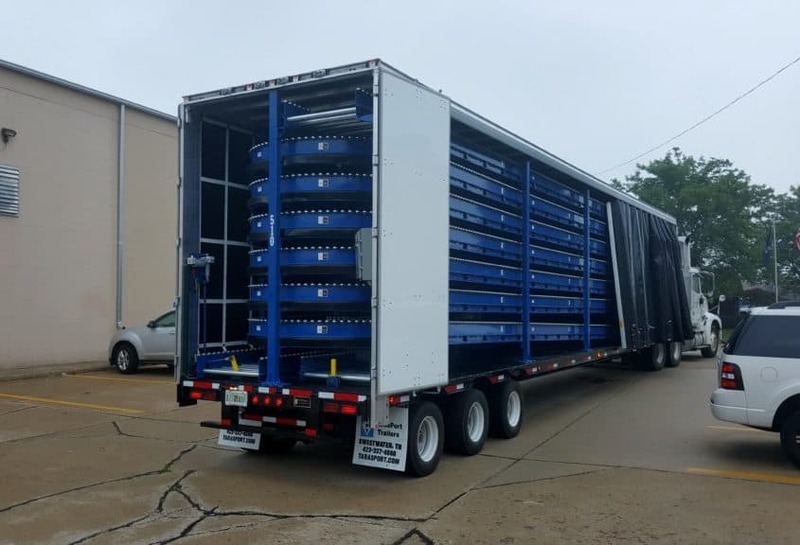 Ultimation recently began deliveries of all-new tire and wheel trailer conveyors for the plant which will help ensure the assembly line has parts available at all times. Detroit-Hamtramck (D-HAM) is among General Motors’ most complex Manufacturing Assembly facilities in North America building four vehicles on one production line. Detroit-Hamtramck is also the epicenter of electric vehicle production producing all of GM’s extended-range electric vehicles. 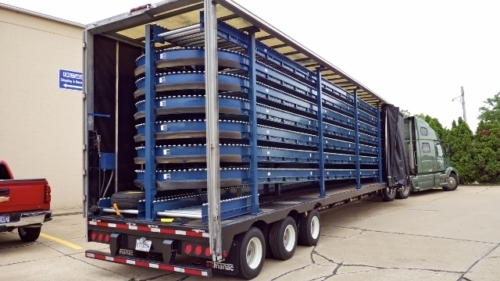 Each of the four tire and wheel conveyor trailers built by Ultimation feature a 7-level roller conveyor system. 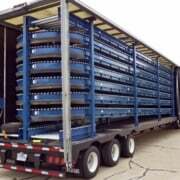 These trailers can thereby transport up to 240 mounted and inflated wheel and tire assemblies. Wheels and tires are mounted in an off-site location and supplied “just in time” to the GM assembly plant. The trailers feature the well-proven Itoh Denki motor driven roller (MDR) technology. Instead of traditional motors with chain drives, the trailers feature a conveyor system with several hundred motorized conveyor rollers. The unique and compact power transmission system has proven remarkably durable in tire and wheel delivery applications. This includes various applications in Michigan’s severe climate conditions. Everything that moves on the trailer is accessible via an innovative design. The design features side opening curtains and a front access door. Any motor on the system can be accessed within seconds. Each motor has a rated life of more than 10,000 hours. 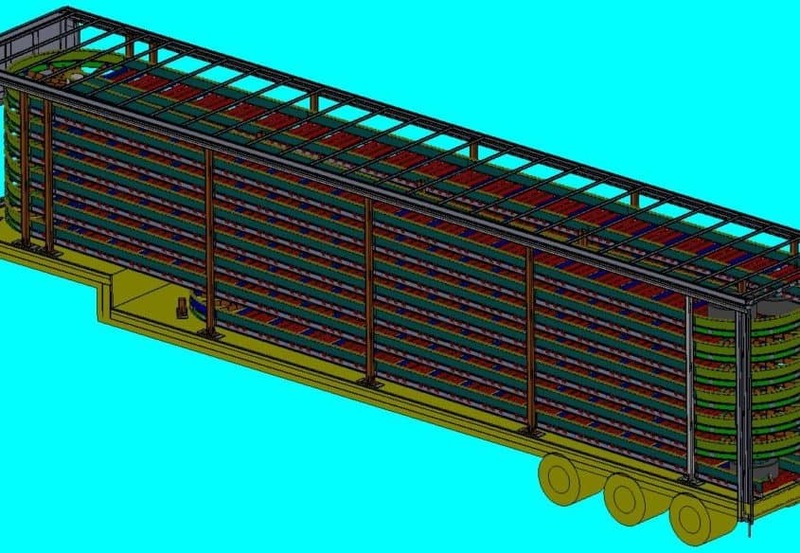 Many of the components in the tire and wheel trailer conveyor system are produced using CAD-CAM technology. The design process starts using a 3D CAD design process. Once prototypes are built and tested, the production components are created using computer controlled laser cutting and forming technology for the conveyor frames. Final assembly involves assembling the many thousands of components at Ultimation’s Roseville, MI facility, followed by testing on-site and at the customer locations.